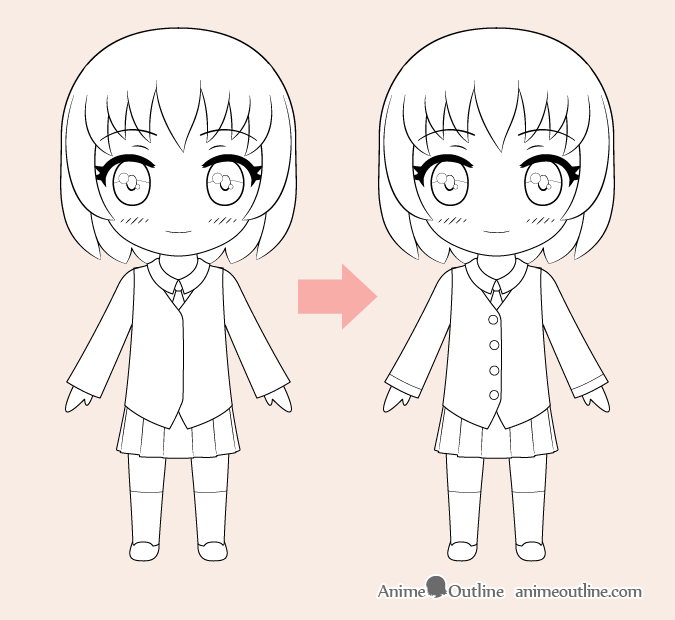 This tutorial shows how to draw a highly stylized female “Chibi” anime character with a big head and a small body. It provides suggestions for the proportions for the body as well as the placement of the facial features. 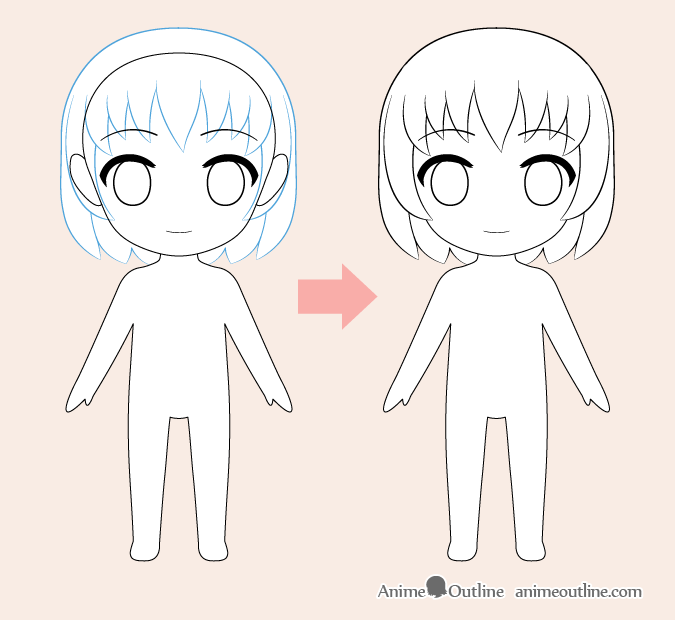 Chibi anime characters have highly stylized heads and tiny bodies. 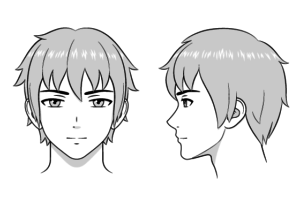 These types of characters can be great for making quick storyboards and simple manga or animations as they can be drawn much quicker then a more realistic and detailed character. Because of their big heads they are also great for showing various emotions. Please note that if you are going to be following along using pencil and paper you should make light lines for the initial stages of the drawing as you will need to do some erasing during different steps of the tutorial. 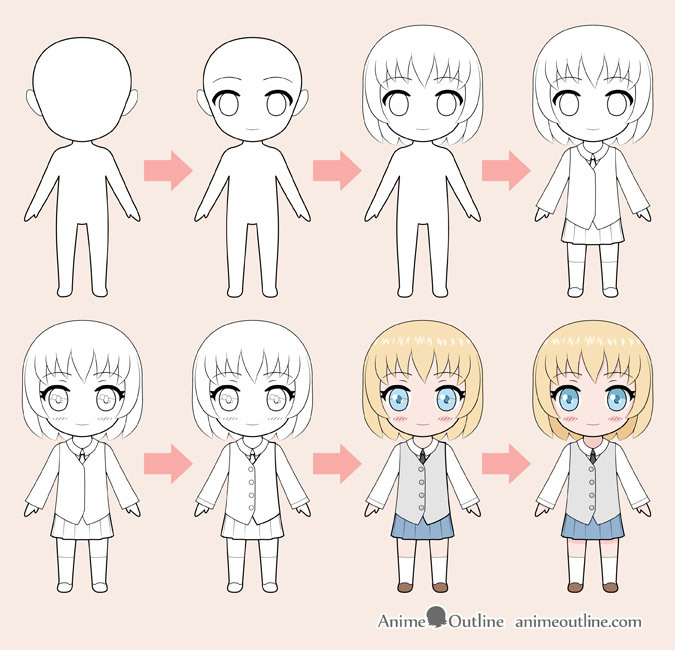 Please note that the body proportions in the above example are just a suggestion as there is no one set way to draw chibi bodies. 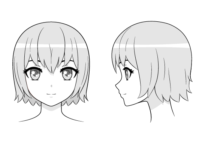 Some can have absolutely huge heads as big as the body and some can be closer to more standard anime characters. 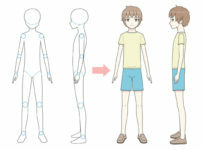 To follow this example draw the character’s body as tall as one and a half of their heads. Draw the torso the same legs to be the same height. The hands and feet of chibi characters can often be drawn without showing the individual toes or fingers. For this particular style draw the thumb without the details of the fingers (as though the character is wearing mittens). Please note that these proportions (just like those for the body) are only suggestions. Draw a horizontal line between the bottom of the eyes and the chin and draw the mouth below that line. 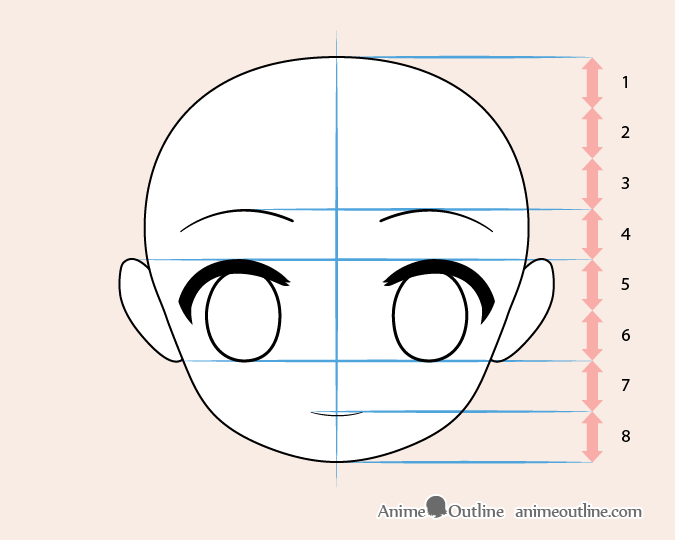 Draw a horizontal line 1/8 of the face in height (one division in above example) up from the top of the eyes and draw the eyebrows below that. As is often the case for chibi characters you can avoid drawing the nose all together. 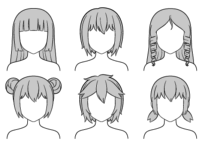 Please also note that though the ears are provided as a reference they will be covered by the hair in later stages of the tutorial. 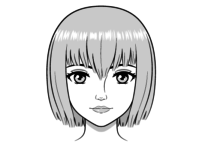 As chibi heads are usually so huge huge chibi hair can still be drawn with quite a bit of detail. For hair like in the above example draw the top part of the hair following the shape of the head and then branching out into individual clumps that narrow towards the ends. Erase the parts of the head that are covered by the hair after you are done. 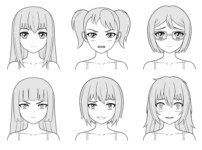 You can leave the eyebrows and other facial features (if you want to draw a different hairstyle) overlapping with the hair as this is fairly common for these types of characters. Just like chibi bodies chibi clothes tend to be simplified (drawn with less detail and fewer to no folds). 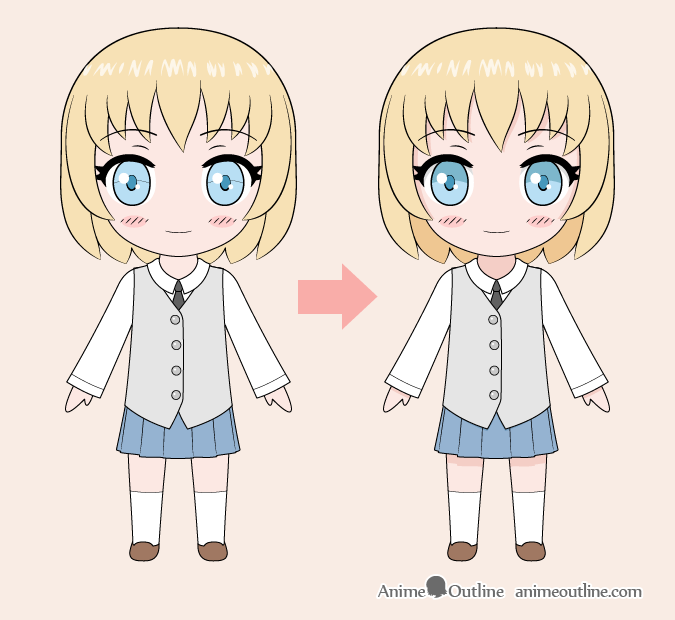 In this case the character will be wearing a basic school uniform. 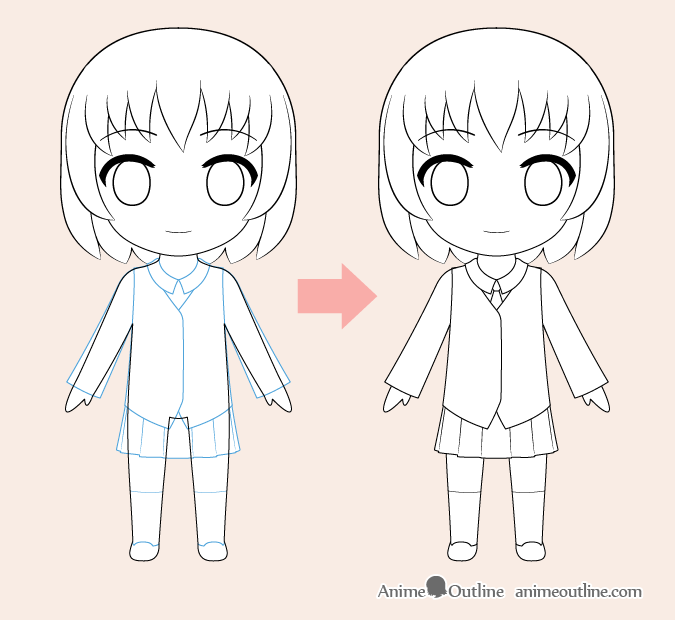 Draw the top part of the outfit as well as the shoes and socks pretty much hugging the shape of the body with the sleeves and skirt fanning out towards the bottom. Finalize the line drawing by adding the smaller details. On the face add the pupils, reflections in the eyes and eyelashes as well as the some blush on the cheeks. You can also draw a pair of very light lines to indicate the top area of the eye (which will be shaded darker). This area tends to be darker because of the shadows cast by the eyelashes as well as the reflection of the darker colored eyelashes in the eyes. On the clothes just add the buttons. Start by filling in each area with the appropriate color. If you are coloring on paper be sure to leave the reflections in the eyes, hair, and buttons white. If coloring digitally add them in at the end. For the neck you can just darken the entire area for the rest of the shadows make draw them roughly tracing the shape what is casting them (hair/skirt/sleeves/eyelashes). For the darker top of the eyes you can use the line from the previous step to separate the dark and light parts. 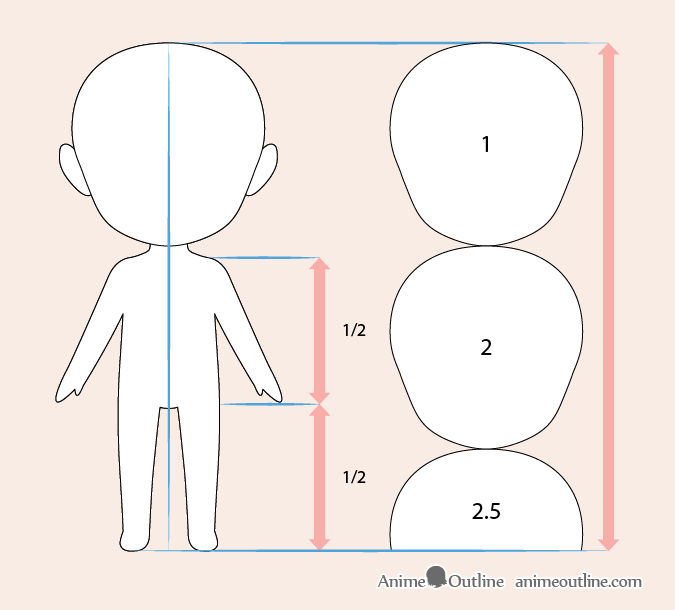 There is a lot of variety when it comes to the shape and size of chibi characters. 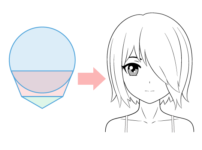 This tutorial provides one example of how to draw such a character but you can always try and tweak or even completely change the proportions to see what you get.